It's a striking focal point, thanks to the brightly-colored pottery used. The sound of cascading, gently-splashing water will relax you. A preformed pond liner will be sunk into the ground to serve as a reservoir. Water will be pumped via a tube from this reservoir through the two pieces of pottery. The piece on the bottom (which is a standard pot) is the bigger of the two; it will be inverted. The piece on the top is a tilted pot and will function as a spout. The water will cascade from this spout down onto the exterior of the bigger pot and back down into the reservoir, completing the cycle. This attractive cascading fountain won't break the bank. Home improvement stores also sell two-tiered, antique barrel fountains that come at an inexpensive price, which is important if you are landscaping on a budget. The concept behind the ensemble is nice, but the color is dull, and it is too obviously made of plastic. Nothing says low-end like plastic. 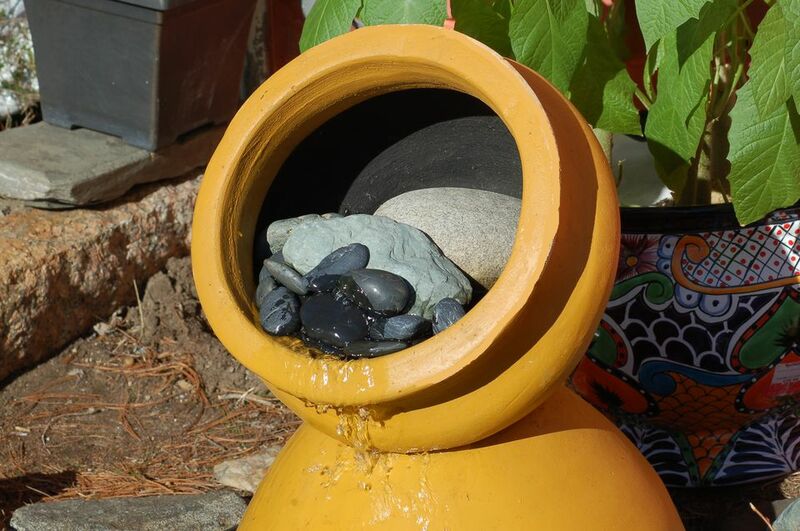 The clay pot fountain is not the cheapest of water features, but it is well worth the price. If the pottery you buy isn't glazed, you'll have to waterproof it, yourself. Apply two or three coats of a clear finish (one intended for ceramics and for outdoor use) to the inside and the outside of the pottery. Let it dry thoroughly between coats and after the final coat. But take the extra time (and spend the extra money) to purchase glazed pots, instead, because they are higher quality. If the least little thing goes wrong with the DIY waterproofing job, the paint may start flaking off of the pottery. You do not have to worry about all that if you just start out with glazed pots. The trick, though, is to find a glazed tilted pot that will match the color of the pottery you are using for the bottom piece (or, if not match it exactly, then at least be compatible with it). Some garden centers carry glazed tilted pots put out by The Pottery Patch, others sell potentially suitable products from the Talavera Pottery or Ravenna Pottery lines. Small, local potters may take custom orders. If you prefer to shop online, The Pottery Patch carries a glazed tilted pot in blue (CH706 Chata On Side); match it with a regular glazed pot (to serve as the bottom half of the water feature) in a similar color. When you buy a pump, inspect what's inside the packaging carefully once you get home. It may contain a little plastic bag with two adapters in it. These are reminiscent of adapters you might see in a ratcheting socket wrench kit, except that they're plastic. Point is, they're very tiny and insignificant-looking, so it would be easy to lose them or, worse yet, throw them away by mistake. But you do need an adapter; it will function as the conduit in between your pump and your tubing. The pump used in this project is an Aquagarden pump (put out by Pennington). This $20 pump is cheaply made. Its casing may fall off when you are setting up the fountain. If it's available where you shop, buy a Little Giant pump. It may cost a bit more, but it's worth it. This project uses SmartPond Flexible Tubing (1/2 inch ID, 20-foot length); it is manufactured by GeoGlobal Partners. It's made of plastic and is hard to work with. The older, rubber tubing is better. It is more supple. However, it isn't readily available in stores. If you're stuck with using a plastic tube, try to purchase a hose clamp that will fit it. The right hose clamp could secure the tube around the pump's adapter more tightly, giving you a more reliable fit. Is a GFCI electrical outlet nearby? This will be the power supply for your pump. Are there any underground utility cables present (call the Dig Safe phone number if in doubt)? If so, you won't be able to dig there. If you will be growing plants around your water feature, what sunlight conditions do they need? The spot you choose will have to meet those requirements ​since horticultural success largely hinges on locating plants properly. The optimal location will be one where you will be able to enjoy your clay pot fountain to the fullest (for example, near a patio where you can relax and listen to the gurgling of its cascading water, or maybe near a garden arbor where you can sit in the shade). Once you've decided on the location, invert the preformed liner, place it on the ground, and trace around it with a spade to indicate where you need to dig. Remove the liner and begin digging. If your liner has a depth of 7 inches (and a diameter of 2 feet), dig down gingerly to remove a few inches of soil, checking on the depth with a tape measure as you proceed. When you've dug down to a depth of 5 to 6 inches, switch from spade to trowel, so that you can control your digging better and not overshoot the 7-inch depth required by too much. Pour a small amount of sand into the hole and spread it out along the bottom. The sand serves as an adjustable base for your liner, a base you'll be able to subtract from or add to as needed in leveling the liner. Insert the preformed liner into the hole and check for level, making the appropriate adjustments. The rim of the liner should stick out about 1 inch above the ground. You can hide it with rocks now if you'd like, or you can wait until the end of the project if you prefer. There's more than one possible way to build a base for a fountain. Adapt the instructions that follow to your own unique goals and circumstances. For example, a grill grate isn't the only type of base you could use. If you have an old one lying around, it would make sense to recycle it in this project. But other DIY'ers have used heavy gauge mesh, a plastic grate, and similar materials to achieve the same end. You can sometimes pick up grates on the cheap at flea markets. All you need is something with holes in it (for the tube to pass through) that is strong enough to support the two pottery pieces. Place four bricks on the bottom of the preformed liner. Lay the grate on top of these bricks. The pump will sit under the grate, and the pottery pieces for the fountain will rest on top of the grate. A tube will be fed up from the pump (through the grate) into the pottery. Remember, a cord runs from the pump to an electrical outlet, so the pottery can't rest directly on the bottom of the liner: There needs to be a space for this cord to pass under, at the very least. Besides, elevating the pottery means that more of it will be plainly visible, and you'll have a taller fountain. Sometimes, it's the (seemingly) simplest steps in a DIY project that trip us up. And almost as often, the solution is as simple as reversing the order in which we take the steps. That can be the case when working with the tubing in setting up this clay pot fountain. Temporarily move the grate off of its bricks in order to facilitate the operation. Thread the tube through the grate. Attach the tube to the pump underneath. Do not make a final cut in the tubing right away. Instead, begin by cutting it to approximately the correct length, erring on the side of too long rather than too short (since the former can be corrected; the latter cannot). While you still have easy access to your pump, make sure the setting for water flow is on high (assuming you want maximum power). You don't want to assemble all the plumbing only to find that it's on low, meaning you have to disassemble the plumbing to access it, and then assemble the plumbing all over again. The project is really quite easy from this point on. Bring the larger pot to the preformed pond liner, invert it, and thread the tube through its drainage hole. Once you've taken up the slack, place the pot on the grate. The larger pot is now ready to serve as support for the smaller, tilted pot. A selling point for this design is that you don't have to worry about caulking between the two pots, as is necessary for some fountain designs. The little bit of water that seeps out at the intersection of the two pots (as gravity pulls water from the top pot down through its drainage hole) won't be noticeable since it will be overwhelmed by the main cascade of water. This seepage will drop back harmlessly into the pool; there will be no water loss if your pots are positioned over the pond liner. The final step is simple. Stack the tilted pot on top of the first pot you installed, lining up their respective drainage holes. Thread the tube through the drainage hole of the tilted pot. Now plug the water pump into the GFCI electrical outlet to gain a sense of how effectively your fountain is working and what impression it is creating. A big water jet shooting out of the tube adds drama, and it also intensifies the sound of the moving water. If you don't like the look of the tube showing, insert stones into the pot to hide the tube. Another way to hide the tubing would be simply to trim it so that it doesn't stick very far up into the pot (in which case it will be covered in water). But there are, in fact, all kinds of possible variations to consider as you put the finishing touches on the clay pot fountain project. Which variation you choose will depend on your objectives and tastes. One factor to consider regarding the jet is water loss over time. If the cascading action produces a lot of splashing, little by little you'll lose water from your reservoir. Water loss may seem minimal at first glance, but it adds up. So you will have to remember to refill the reservoir periodically even if you notice just a bit of water loss. This is especially true when you're using a small reservoir to catch the cascading water. If you fail to keep the pump submerged in water, it will burn out. Another finishing touch you may wish to apply is decorative river rocks. Finally, consider using water garden plants such as Egyptian papyrus in your pond to complement the fountain. To further embellish the water feature, grow plants suited to wet areas around the perimeter of the pond. Upon disassembling the clay pot fountain when cold weather comes, store the pottery away somewhere out of the elements.